The track season has come to an end for most Montgomery County athletes, but the tension is building for those who qualified to move on to the Maryland State Championship. Due to an ice storm last week, the 3A West Regional Meet and 3A State Meet were rescheduled. Consequently, 3A athletes will have their seasons extended by a week and will not be a part of this week's state championship activities. More importantly, both the 3A and 4A teams, who were scheduled to run on the same day, will have their meets shortened, greatly reducing the recovery time between events. This poses a new challenge to all of the athletes who were planning on competing in two or more events. Montgomery County will not have to wait until Tuesday for its first state champions. Clarksburg and Northwood are each sending two regional champions to compete for 2A state titles. Clarksburg has the top seed in the shot put in Avery Graham. Graham will also be a top competitor in the 55m dash, although he has not been able to match his PR of 6.54 from before he got injured over a month ago. Petros Bein of Clarksburg is coming off his best race of the season in the 55-hurdles, but has a strong group of sub-8 guys that he will be up against. Northwood's Derrick Powell has the top seed in the 2A 300 and the second fastest seed in the 500. Giovanni Reumante of Northwood, coming off a 4 second victory in the 800 at the regional meet, has the top seed in the 2A 800. With such a strong duo, Northwood may be able to take down Clarksburg in the team scoring after losing to them at the county championship and the regional championship. It will be a long shot for either of these teams to win the 2A state title with very strong teams in Baltimore Poly and Middletown. The Poolesville girls really put on a show at the 1A West Regional Meet. Now it's time to see how they stack up against the other two regions. They are favored to win the 4x800m relay, Jenny Reid is the top seed in the 1600 and Chelsea Glowacki is the top seed in the 800. Olivia Durr and Karissa Harris will bring the speed to this all-around strong team. The state likes Digital Harbor to win the girls team title beind the McClure sisters filling out the sprints, but the Poolesville team is going to surprise people. Wootton's Olivia Ekpone ran all over Montgomery County at the county championship, but the 4A State Championship on Tuesday will be her biggest test yet. In the 55m dash, she will have to go through Kristyn Lawson of Wise High School who won the 55 at the Montgomery Invitational in 7.09. In the 300, Ekpone will be trying to get back at the Thomas Johnson girls who took the top two spots at the 4A West Regional Meet. Doris Anyunwu from Eleanor Roosevelt will also be a force in that race. The middle distance races will likely be the Tasha Stanley Show, as the Eleanor Roosevelt senior has been running as well as anyone in the nation this year. Leslie Morrison of Whitman is the only person in the field who has beaten Stanley on the track, and since she is not going to be in the 500, she will be gunning for that 800 state title. In the distance races, MoCo athletes are favored to take home the golds between Whitman's Morgane Gay in the 1600 and Churchill's Louise Hannallah in the 3200. Their tasks will not be easy, as Gay will be up against star freshman from Eleanor Roosevelt Amirah Johnson, and Hannallah will be up against cross country state champion Teshika Rivers. Nobody will touch Thomas Johnson's Emily Vannoy in the shot put, who will likely break the state record of 42-07.75. Sherwood's Arleigh Rose is a good bet for 2nd place after throwing 36 feet late this season. Montgomery County girls teams will place well, especially Churchill and Wootton, but a win is a long shot. They will once again be up against the strong Thomas Johnson girls who won the 4A West and the Eleanor Roosevelt girls who never seem to lose. I will confidently say that Eleanor Roosevelt girls should win this meet convincingly. Richard Montgomery, Quince Orchard, Blair, and Gaithersburg are all sending strong boys teams to the state meet. Each of these teams has different strengths and weaknesses. Gaithersburg will be strong in the field, especially with Sean Stanley who is heavily favored in the shot put. Gburg also has two high jumpers competing and one of the top middle distance runners, Antonio Palmer, who will be trying for his first state titles in the 500 and 800. Palmer will have to face Eleanor Roosevelt's star runner Daniel Edmund, as well as Walter Johnson star Chris Moen. Richard Montgomery unfortunately was not able to get Gary Frazier to the regional meet, and therefore will only be able to use him in the relays at states. This hurts their chances in the team scoring, but expect Tyler Jackson, Alonzo Evans-Chase and Brendan Etzel to step up to help the team. Etzel is heavily favored to win the 300 after running 34.47 this year. He will have to take down Brandon Felder of Oxon Hill, who was disqualified in the 55m at his regional meet. Etzel is hoping to be fully recovered from his injury at the regional meet. Evans-Chase was the top finisher behind Linganore's Patrick Balderson at the 4A West Meet and will be looking to surprise people at states. Tyler Jackson is favored by fans to be a repeat state champion in the 55m hurdles, but he will have to go through Ernest Cooper of Wise who is the outdoor state champ in the 100m hurdles. Fans voted Blair to win the 4x200 at states, which shows that people are beginning to realize their speed on the state level. 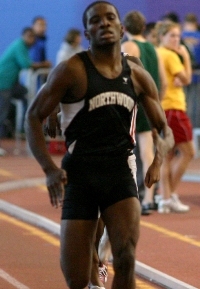 They will be led by Jonathan Haughton in the 4x2 and 4x4. 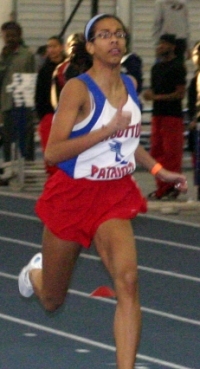 Haughton also qualified in the 55 and 300. Quince Orchard brings the strongest distance runner in Neal Darmody, who was voted the favorite to win the 1600 and 3200 at states. The shortened meet may have an effect on him, but there's nothing that can be done about it so he's going to go after both events anyways. QO will be going after the 4x8 state title, but have to run after Eleanor Roosevelt who ran 7:58 at the New Balance Collegiate Invitational. QO will also be counting on points from David Laratta and Wayne Bartholomew in the middle distance events, Caleb Malone in the hurdles, and Marcus Brown in the shot put. The Eleanor Roosevelt boys are not as deep this year as they usually are, and an especially strong year from Linganore will make the team race interesting. ER and Linganore will rack up the points, but Blair, Gaithersburg, Quince Orchard and Richard Montgomery have all qualified enough athletes to win the meet with outstanding performances from everyone.